The pictures are all over the place this spring. Moms and kids, playing together, making memories, having photographic evidence of it. It's fun. I know you've seen the pictures of chalked balloon, and kids lying on the pavement as if they're being carried away by the colorful bouquet they're faux-holding. The picture is taken from far above (like atop a skyscraper, or picnic table) so that you can get the whole child and the balloons in the shot. If done right, it's a cool shot, and the kids have a good time posing as well. Knowing that I had a few handicaps, I attempted this photographic feat myself. The first downfall was the patio that we have. It's huge, and we lurve it, but it's made of pavers and not concrete. Drawing on pavers is like painting on pallets. There are cracks in the finished product. Imagination: Required. The second flaw was the time of day. Lighting was horrid, with shadows and setting sun. We couldn't just move elsewhere, either. The third flaw was the fact that the tallest thing I could stand on was the picnic table. For anyone besides me, it would have worked well. I'm vertically challenged, and the lens on my camera is permanently zoomed to 50mm. This means that I couldn't get tall enough to do the job right. The fourth flaw I had was the fact that Micah didn't grasp the concept of "lay down and pretend you're holding onto the balloon strings." Maybe because he didn't get the fact that I drew balloons. 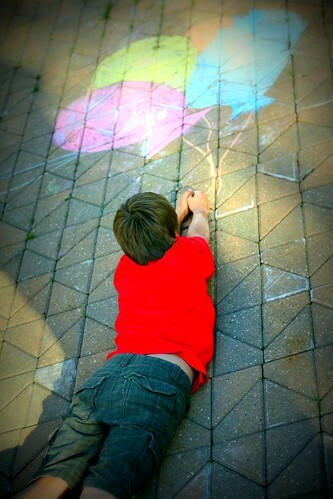 When I color on the patio with the kids, Micah's goal is to play Bumper Chalk. His piece of chalk can bump my piece of chalk off that particular paver, and he'll be glad to prove it! Yeh, it makes for fun coloring. Micah was a challenge. But I had a plan. I'd get Luke to lay down, I'd take his picture, and show Micah how fun it would be. He'd be on board in a hurry, because he'll never allow himself to be outdone by his big brother. (Don't dare tell Micah I just called Luke his big brother. I know he is, and you know he is, but Micah is in denial. Or rather, Denial, with a capital D.) It sounded like a good plan (like all my plans do in my head, just before they spiral downward), but Micah never did get on board with things. He looked at Luke and I as if we were practicing the Stop, Drop, and Roll procedures. Micah never made the attempt. Luke, however, is an actor at heart. He lives for the stagelight, and by golly, he had mom's full attention AND her camera. He posed this way, and that way, and pretended to be flying away. He lost a shoe and let it dangle from a toe quite realistically. But Luke couldn't be content to just sedately hold on with one hand and let the balloons carry him away. Luke is a boy. If there's not some sort of over the top action going on, it's no fun at all. Yep, he turned those girly little balloons into super-helium-infused orbs that were dragging him out into the stratosphere. The world of boys is a fun one. It's our world. awesome! caught up with your posts ya'll been busy enjoying spring! I went to a garage sale on saturday and petted my first alive corgi! You never told me they are amazingly SOFT!!! I fell for her but her mom and dad would not let her go. Uber sweet too. Winning breed, adorable. I quite like Luke's picture much better than the simple balloon ones. Much better. Love it! That is really a great shot, and Luke is so imaginative!